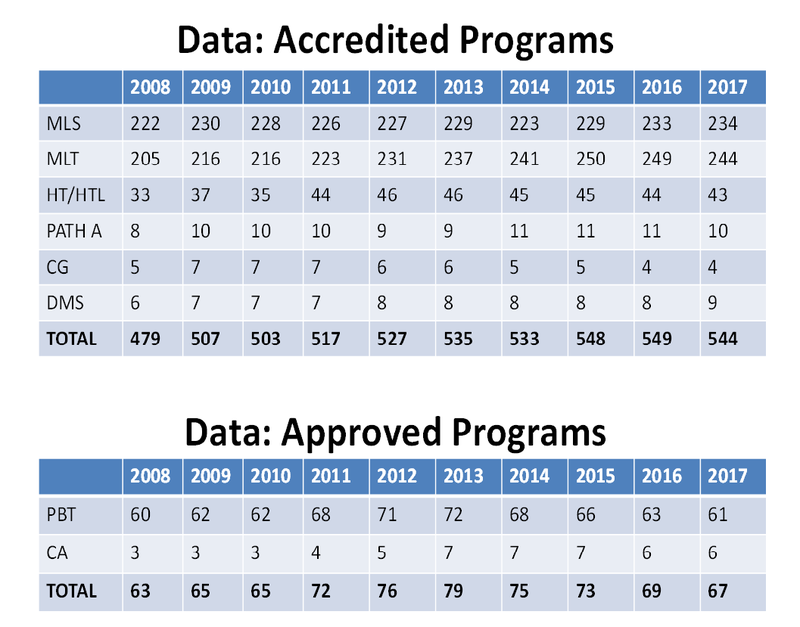 Table 1– NAACLS Accredited and Approved Programs by Type from 2008-2017 (click on chart to enlarge). 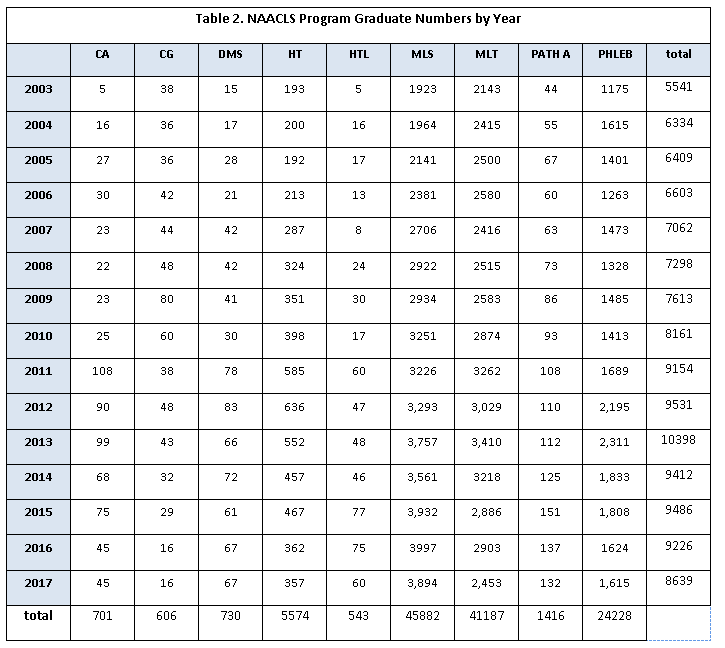 Over the 15-year period increases are seen in the numbers of graduates from most NAACLS accredited and approved program types. With the exception of CG program graduates, all program types reveal an increased number of graduates and, in some cases, the increases are striking. Increases in PathA graduates reflect an increased number of programs and also implies that this profession is rapidly expanding. Graduate numbers are highest for most program types in the years from 2010-2013 and that may have been a socioeconomic response to the recession of 2008 followed by a slow, multi-year recovery. Slower economies and sluggish job markets tend to encourage more people to pursue higher education degrees. Other factors could include administrative pressure on program officials to increase enrollments, more effective student recruitment strategies, increased demand for alternative education delivery models, and the development of innovative approaches to the provision of the clinical experiences. Certification exam pass rates – Three year rolling average of 75% pass rate on BOC examinations taken within the first year after graduation. Several other examination providers are applicable for graduates of phlebotomy programs. Graduation rates – Three year rolling average of 70% graduation rate for students who have begun the final half of the program. Placement rates – Benchmark: Three year rolling average of 70% finding employment or continuing education within one year of graduation. In summary, the 2017 NAACLS Annual Survey of Programs data reveal that there have been modest increases in accredited and approved programs over the past decade and significant increases in the number of graduates of most program types over the last fifteen years. For some program types, such as Medical Laboratory Technician programs, the increases are more significant. Although Pathologists’ Assistants programs are fewer in number and statistically difficult to evaluate, the increases seen for these programs suggests a rapidly expanding demand for programs and graduates of this relatively new profession. The percentages of NAACLS accredited and approved programs that have demonstrated success at meeting benchmarked outcomes including certification exam pass rates, graduation and placement rates have been stable over a 3-year period. Small increases in program class sizes, budgets, clinical placements, and faculty resources have been reported. Comparing the numbers of program graduates (Table 2) with trends in program resources (Table 5) suggests significant increase in program production of graduates without the benefit of large increases in resources. Lastly, there have been significant numbers of newly approved program directors within the last year that not only reflects increased numbers of programs but also a notable turnover in program directors of continuing programs. The numbers of new program directors creates challenges for NAACLS’ volunteers and staff to assist these new directors as they adjust to their new responsibilities. NAACLS must also provide continuing education opportunities for these and other program officials.